Monday - No warm up. Students continued to review for the Expansion Test. Tuesday - No warm up. Students took the test. Attached is the break down of standards and questions. Also here is the test corrections worksheet - these should be done by Friday April 1st. Corrections must be done BEFORE you can retake any portion of the test. Wednesday - 8B Ski trip to Bridger Bowl. Monday - WARM UP: Students watched this video then answered the questions. 2. What impact did she have on slaves? What about plantation owners? Explain. Then students continued working on their stations about life in the south, and students began writing a slave journal entry. This was all due Tuesday. Attached are the directions. Students went to ONE station and began filling out the notes on their station. They matched the image (all eight are attached) at their station to one of the eight quotes (attached) in the folder at the station. Tuesday - WARM UP: If you had been alive in the mid-1800s where would you want to live (North, South, West)? Why did you choose this region? Then students finished stations, completed their jounrals, and we passed back work. Wednesday - WARM UP: Students wrote down one thing they feel confident about (Westward Expansion, slavery, life in the North/ South) AND one thing they are confused about. Then students played a review game. All students were emailed the study guide. A TEST on this unit will be next Tuesday, March 8th. Thursday & Friday - Student reviewed for the test. A study guide was emailed to them. WARM UP - 1) Describe one of your favorite memories from childhood. 2) What was your biggest responsibility when you were a kid? Students then compared their lives as kids (10 or under) to the kids of the 1800s who worked in factories. Students completed these notes and analyzed primary sources. Tuesday, February 23rd - WARM UP - Students watched this video about sweatshop labor then answered the questions: 1) How does this connect to our discussion yesterday? 2) Is there any part of this song/video that you disagree with? Why? Then students logged onto NewsELA and used the class code CPENPJ to create a username (if they don't have one). This handout will also help you log in. Next students read ONE of the three assigned articles. Students use the articles to complete the graphic organizer comparing child labor in the 1800s to child labor today. Here are pdfs of the three articles IF you cannot log onto NewsELA. Finally students can read about the debate "Is it fair to pay teens less than adults?" Attached is a pdf of the article OR students can go to the Upfront magazine website. Login as a student and use the password 1776freedom. It will say welcome Mr. Lundy's class - that is okay :) Then look in the February 29th issue of Upfront and find the article. If you read online you can vote on the issue - the results will be compiled by Upfront and reported in March :) Share your opinion with students all over the country! 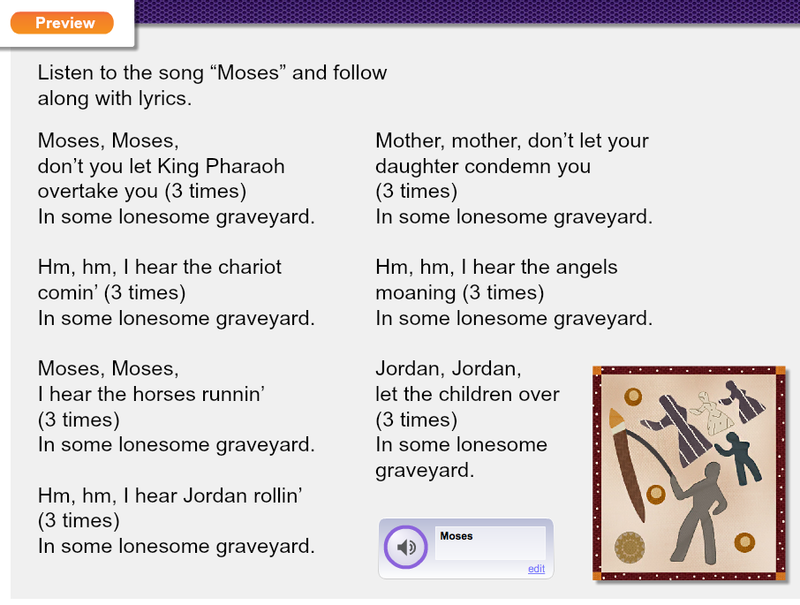 Thursday, February 25th - WARM UP: Listen to the song Moses (YouTube video). Attached are the lyrics that were actually played.1) What three words describe the songs mood? 2) Who might King Pharaoh represent? What about River Jordan? Next students began learning about "life in the south". Students first took notes in their interactive notebook for this lesson (attached) on free African-Americans in the north and south then they read about slavery in the south and filled out the graphic organizer on page of 1 of their interactive notebook. Next students read page 407 - 408 in the textbook about plantation life. With their small group students answered the Section 3 question. Finally, students chose a partner to begin a gallery walk with. Students have eight stations they will visit over today and Friday. Attached are the directions. Students went to ONE station and began filling out the notes on their station. They matched the image (all eight are attached) at their station to one of the eight quotes (attached) in the folder at the station. ​Students were not required to read a section. They did need to complete parts #1 and 2 of the notes. Attached is an answer key. 1. What change did the cotton gin bring to the South? 2. How did this impact slavery? ​Then students continued to work in their stations learning about slavery and the South. Students should have completed notes on Stations A - H in their interactive notebook. Monday, February 15th - NO SCHOOL because it is President's Day. Here is an article on the history of President's Day, a National Holiday. ​What is the message of the quote? Why are these people coming to America. Then students talked about push and pull factors. Push factors are what motivate people to leave a place (pushed out) while pull factors are what motivate people to come to a place (pulled in). This is important because many immigrants today are affected in a similar way. 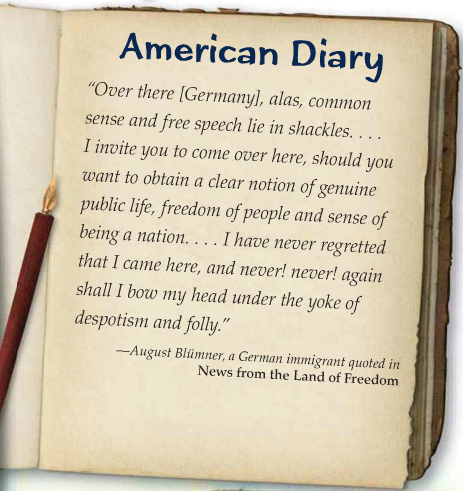 Students read pages 398 - 399 on immigration in the 1800s and filled out a graphic organizer. On the left students listed three push factors, and on the right side they listed three pull factors. Finally students completed the political cartoon activity on page 398 of the textbook. 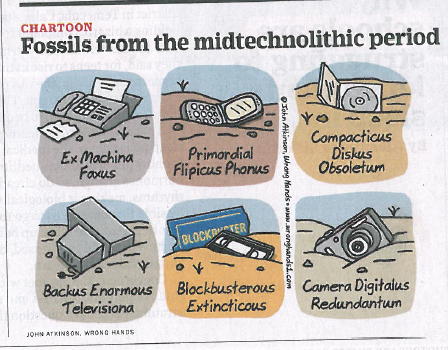 2) Why are they "extinct" now? 3) How are these similar to the inventions that we looked at yesterday (technology)? 2) Who are the important people? Who invented it? 3) Why is it important? Attached is an answer key Ms. Burns and Mrs. Hancock put together if you were absent or want to check your notes. There are also links to videos and other sources. Friday, February 19th - WARM UP: Students wrote down a question they have relating to the Industrial Revolution or Westward Expansion. If you don't have one then think of one that "stretches what you know"... Then students retested on the Constitution or completed a "choice activity". Directions for the "choice activity" are on the top right hand of this webpage :) Turn in or email us what you learned from your "choice activity"
What is another name for the War of 1812? Why is this important to American history? Proved that the United States was powerful and capable of defeating the British not once, but twice. Ms. Burns gave a brief lecture on the events leading up to, the war, and effects of, the Mexican American War. Students will take notes or annotate depending on individual needs. Students will then break into at their tables and read and discuss their assigned “role card”. Mexican Soldiers, American Soldiers, Mexican Settlers/Californios, and American Settlers. Discuss how each of these individual groups felt about Manifest Destiny and the Mexican American War. Write your responses on lined paper to turn in at the end of class. Be sure to include the names of all of your group partners on the paper. Back up your claims with evidence from your notes. Explain who your group is. Why are they important? Where are these people from? Think big picture not specific (region). Did your assigned population agree with Manifest Destiny and the Mexican American War? Why or why not? 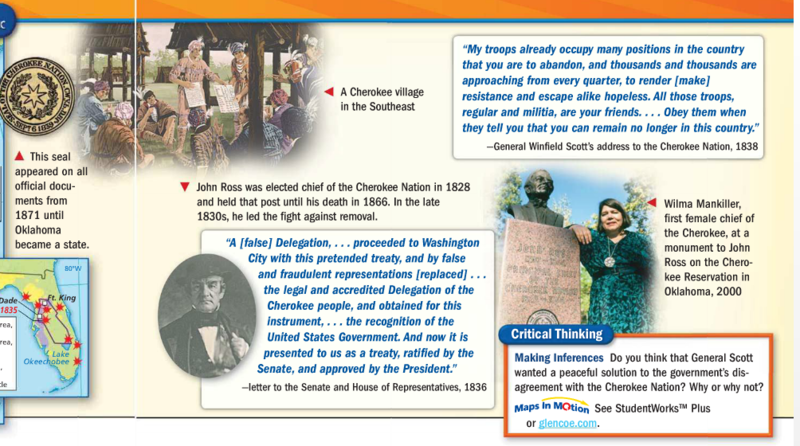 Did the War and Manifest Destiny benefit or hurt your assigned group? Explain. Jackson was the 7th president of the United States, elected in 1829. Rose to fame because of the War of 1812 (hero… or was he?). “Rags to riches story” - Was born in poverty in Tennessee, the “people’s champion,” received most of the votes cast in the frontier states. Also called Old Hickory because during the War of 1812 he made a name for himself as a tough commander, and he carried a cane that he would use to beat people with. Was in numerous duels, eventually died of lead poisoning from all the bullets lodged in his body. ​Next students independently read the Zinn excerpt about President Andrew Jackson and “Jacksonian Democracy.” As they read the document they will annotate by underlining, circling, writing questions or connections, etc. After the first read through, students can work in pairs or independently to complete the Reading Guide that goes along with the excerpt (Zinn 154-155). According to Jackson, who is considered a “common man’? Are other cultures included in this? Thursday, February 11th - WARM UP - Read the quotes on p. 345. According to General Scott, did the Cherokee Nation have a choice in relocating? Then students completed the Zinn reading (with annotations), reviewed the questions, and turned in their questions. ​In class students will add onto their unit map (color code areas and add dates/titles) using map E on page 47 of the Atlas. Students can also use their timelines and class notes to add additional information to their maps. ​Does this information change the way you see Jefferson? *Remember he was a "founding father", President, and wrote the famous words "all men are created equal". Students turned in their Weekly Warm Ups and their test corrections, stapled to their original test. All tests need to be returned even if the student is not doing corrections. Corrections are due today unless you have talked to Ms. Burns or Mrs. Hancock. In class students read this Upfront magazine article, Rethinking History, and discussed the question "Should colleges continue to honor famous alumni who were racists?" The main point of this discussion was for students to understand how complex history is, and to realize how important it is to study history from multiple perspectives... how do we know what we know about the past? Here is a copy of the WebQuest document. How can you improve your grade? Assessments (standards) count for about 80% of your grade while habits of work, weekly participation, and homework count for about 20%. Since assessments count for so much we always let students grow! Growth mindset is important... If students didn't do well on an assessment it shows us that they have not mastered the material... YET! With the proper support all students should be able to improve. 1) Complete test corrections using your resources (handouts, books, videos, Mrs. H and Ms. Burns) ... you need to show us that you have relearned the content. 2) Once you've shown us that you've relearned the content THEN you will be retested on the standards (content and skills) that you did not master the first time. This picture, The Trail of Tears, was painted by Robert Lindneux in 1942. It commemorates the suffering of the Cherokee people under forced removal. 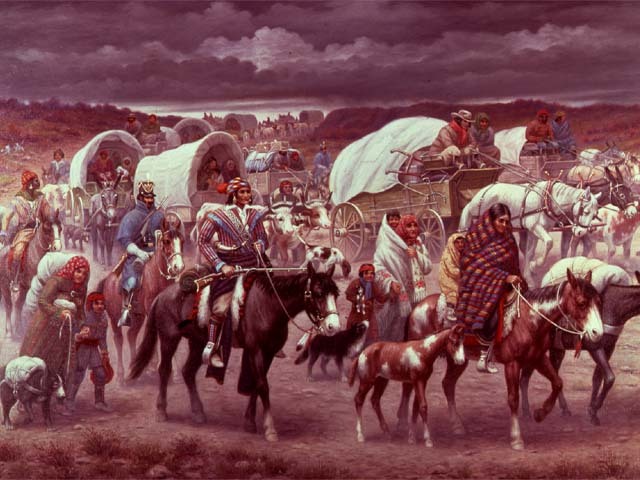 If any depictions of the "Trail of Tears" were created at the time of the march, they have not survived. Taken from PBS.org - image courtesy of The Granger Collection, New York. Monday, February 1st - WARM UP - Students completed a pretest on Socrative about Westward Expansion. If you did not complete the pretest see Ms. Burns. This will be used to determine students who earn "choice activities" or enrichment because they are already familiar with what we are learning. Then students received the materials they needed to add onto their yearlong timeline. The "blue" (Constitution) and "orange" (Expansion focus) additions to the timeline are due Thursday!! Tuesday, February 2nd - WARM UP: Use pages 34 & 35 of “Atlas of United States History” compare and contrast maps B & F and graph C. In your Tuesday WARM UP box answer the following questions: What changes do you notice? How might these changes have impacted Westward Expansion? Explain. Then during class students will closely analyzed, discussed, and recorded “think notes” (handout attached) of John Gast’s American Progress. They may complete this portion of the lesson with their table partner. Do you think the artist chose certain color/light schemes for a reason? How are the settlers/pioneers depicted? Is this different than how the Native American are shown? Why might this be? How is Colombia depicted? Why would the artist have drawn her like this? What might she be a symbol of? Finally, on the back of their “Analysis” worksheet they will follow the prompt and draw their own version of Gast’s painting from a different perspective from the era (early 1800s) (Native American perspective vs White Easterner). Be creative, not grading you on your artistic ability, stick figures are fine. Explain why you chose to draw what you did. What was your rational behind this? 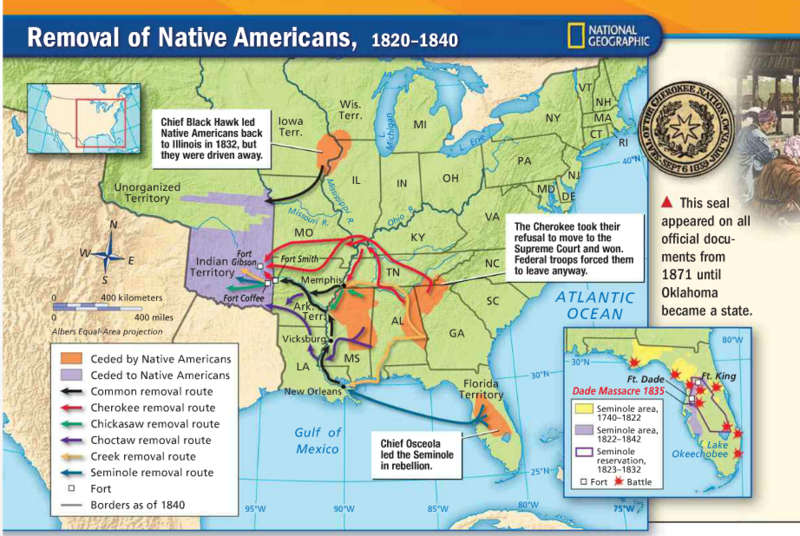 For their Exit Slip students connected history to their lives: How did Manifest Destiny impact to you life today? Why might this be important to you as a middle schooler in 2016? ​Then use pages 40 and 43 to label the eastern states and Mississippi Territory You can write out the settlements or use the postal abbreviations. Next students worked in pairs to complete a “close read” of a primary document that we will call a “Secret Letter to Congress” asking Congress to pass a bill that would allow the President to negotiate with the French about the “purchase of the island of New Orleans.” This shows that there was controversy over whether or not Jefferson’s purchase was constitutional. Knowing that, does this “secret letter” give you any more detail regarding the constitutionality of the Louisiana Purchase? Finally students had about ten minutes to work on their timelines. They are due Thursday at the start of class! Who/what was the Corps of Discovery? What were two of the goals of the expedition? What were 2 successful outcomes of the expedition? In pairs, students will participate in a “close read” of a primary document, which is a list of “Indian Gifts” that were brought on the Lewis & Clark Expedition. Are these gifts being collected from or given to the Native Americans? Why would Lewis and Clark bother to bring gifts for the Native Americans? What are other examples of things that Lewis and Clark likely brought with them on the expedition? 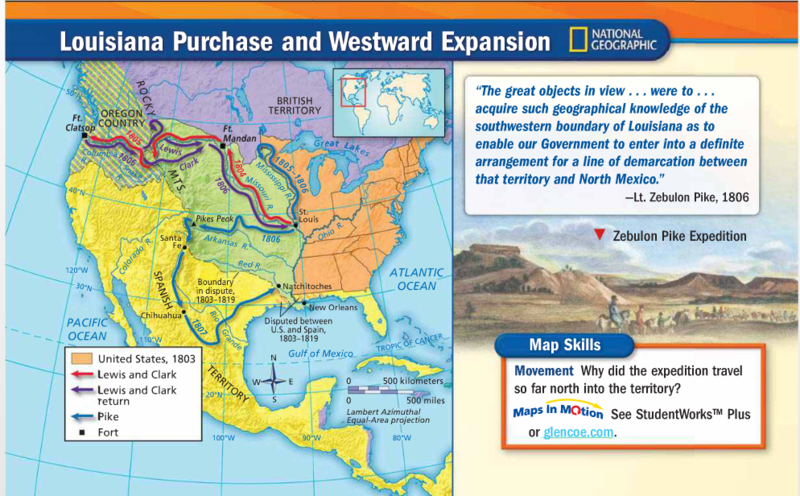 Then students will continue filling in their Westward Expansion Map notes. Color code the Corps of Discovery Expedition route. Use page 283 in the textbook to help you. Be sure to add dates. Add colors to a map key. WARM UP: Students watch a Flocabulary video about "Indian Removal and Manifest Destiny" then answered the question: What is the term for the claimed right to settle every piece of land from sea to sea? IF YOU WERE ABSENT YOU CAN READ OVER THE LYRICS AND THEN ANSWER THE QUESTION. We cannot share the video on the website because it is part of a subscription. Students then reviewed the 5Ws of Lewis, Clark, and Sacajawea. A GoogleDoc was shared with all students. Here is a copy of the document. After that students explored WebQuests to learn more about Lewis and Clarks Expedition and the challenges of westward expansion. Another GoogleDoc was shared with all students with links to the WebQuests. Here is a copy of the document.